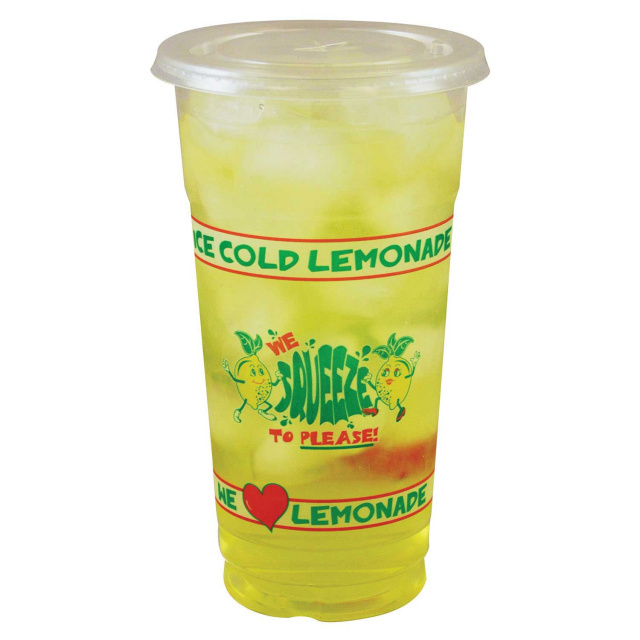 For larger Lemonade Cup orders, please call us at 757-473-8951 for better shipping rates via LTL or UPS Freight. Lemon Ice 16 oz. Wax Paper Lemonade Cups - Squat. Featuring new stylish Lemon Ice Cube Lemonade print. The squat cup is a little shorter but wider around than the 16 oz Lemonade tall cup. Packed 1000 per case. New 16 oz Squat Paper Lemonade Cup with Lemons design. Packed 1000 cups per case. Lids sold separately below. Nice looking souvenir drink cup. New 16 Oz Squat Paper We Squeeze To Please Lemonade Cup. Colorful and unique presentation to serve lemonade for this concession season. Mr and Mrs. Lemon brighten up the face of this cup. Packed 1000 cups per case. New for 2018...16 oz Vintage Lemonade Cup. An old retro friend is back for 2018. This retro lemonade cup is 16 oz and packed 1000 cups per case. Slot Lid for 16 oz squat Paper Lemonade Cup. Each lid will present a tight fit to prevent spillage and ease for carrying. 1000 Lids per Case. Item is not pictured. Berk Paper Company 16 oz. Paper Lemonade - Tall. Tall Wax Paper Lemonade Cup. Easier for kids to grab. Great item to have at amusement and water parks, professional baseball stadiums and other similar venues, and festivals and carnivals. Packed 1000 cups per case. Bright and lively design. Liven up your lemonade sales today ! Lids that fit our 16 oz, 20 oz, and 24 oz Tall Paper Lemonade Cups. Packed 1000 per case. Lemons Design Paper 20 oz Tall Lemonade Cup. Tall double-poly paper cup with Lemons Design packed 1000 cups per case. Lids can be selected from listing above. 24 oz Paper Lemonade Cups. Traditional lemons design. This is a tall 24 oz Lemonade Cup with double-poly construction. Packed 1000 cups per case. Lid for 24 oz Paper Tall Lemonade Cup. Packed 1000 cups per case. New 32 oz. Squat Lemon Ice Paper Lemonade Cups. Colorful green and yellow Lemonade Cups. Packed 480 Cups per case. Slot Lid for 32 oz squat Lemonade Cup. Each lid will present a tight fit to prevent spillage and ease for carrying. 1200 Lids per Case. Item is not pictured. 32 Oz. Plastic Lemon Cup Shaker. Fitted for 32 oz Paper Lemonade Cups. New 28 oz Jar Lemonade Souvenir Cup. This new plastic jar lemonade drink cup will be the hit at your next fair, festival, carnival, or sporting event. They have been all the rave for the spring and summer season. They come with handle, lid, and straw. Not only great for lemonade, but also for root beer, smoothies, slushes - you name it. Old fashioned design still popular for any event or party. If you are looking for the lighted Mason Jar, head on over to our Tropical Drink Cups. 16 oz Squat Tri-Pak Plastic Lemonade Cups. Reusable plastic 16 oz lemonade souvenir cups that includes a green lid and a corruagated bright yellow straw. Matches the design of our Economy 32 oz Lemonade Cup. Packed 500 cups per case. New Tall 16 oz Plastic Lemonade Souvenir Cups with unique raised style dome lid. Packed with 250 cups per case. Comes with lid, straw, and cup. Make a statement with your Lemonade Business with these attractive cups. New 16 oz Tall Plastic Lemonade Cup with Lid and Straw. This 16 Tall Souvenir Cup come with a fun yellow straw and green lid. Packed 500 cups per case. 16 oz Plastic Lemonade Cups with Lid and Straw Combo Pak. Sturdy plastic cups that will stand up under all weather conditions. Each case comes complete with 350 cups, forest green lids, and 9" yellow super straws. This cup in made in the USA, 100 % BPA free, 100% Recycle, SQF and HAACP Certified and dishwasher safe for re-use. Grab your customers attention with these new colorful cups. Premium Plastic 16 oz Stadium Grade Lemonade Drink Cups. Pack 500 per case. A luxury cup at economy rates. Our injection molded lemonade cup will give your customers a souvenir to remember their trip or event by. They can re-use these sturdy well made 16 oz Souvenir Cups. These cups are made with more plastic so they will not weaken or bubble in the summer heat. Lid is included. 16 oz Size "We Squeeze to Please" Plastic Lemonade Cup. Now we carry the 32 oz and 16 oz We squeeze to Please Lemonade Clear Cups. Very unique and popular festive cup. Make you Lemonade cup stand out with this uniquely designed themed Lemonade cup! Packed 1000 cups per case. A cup with enthusiasm! This is the 20CL LID that fits the clear 16 oz We Squeeze to Please clear Lemonade Cups. Packed 1000 Lids per case. Combo Pack 350 Count Premium Lemonade Cups with Lid, Straw, and Cup. This cup holds 22 oz of liquid material.This cup is made in America, 100% BPA free, 100% Recycle, SQF and HAACP Certified and dishwasher safe to re-use. Premium 22 oz. Souvenir Lemonade Drink Cups. Each case comes with 500 Cups per case with forest green lids. This cup is made in America, 100% BPA free, 100% Recycle, SQF and HAACP Certified and dishwasher safe to re-use. New for 2018....32 Oz Lemon Quench Lemonade Souvenir Drink Cup. These Bright and Colorful New Plastic Lemonade Cups will be a featured attraction at your next show. This cup features a bright strong corrugated straw and lid with yellow lemons the backdrop on the green semi transparent cup. Yellow Lemon on Straw are now included. Packed 300 cups per case. New 32 Oz Lemon Quench Lemonade Souvenir Drink Cup. Same attractive cups as listed above, but this case of 300 cups feature 150 blue and 150 green cups with.colorful yellow lemons as the backdrop. A definite souvenir cup that can be used again and again by the customer long after your next event. Comes with yellow straw and lid. Lemon Ice 32 oz Lemonade Cup. One of the most popular Lemonade Cup sold anywhere is the 32 oz Lemon Ice Souvenir Cup. Great attraction to have...customers can take them home and reuse them again and treasure great moments they had at the carnival, festival, fair, racetrack, the beach or at other fun venues. These cups comes with a lid and straw. Suggested Retail for this size lemonade $4.00 to $5.00 a cup. 300 per case. 32 Lemon Sleek Souvenir Cup. 300 Case. Another great 32 oz. lemonade souvenir cup for all your carnival or festival venues! Straws and lids are included. New alternative heavy duty design 32 oz Souvenir Lemonade Cup. This cup features a different design fun from our our other Lemonade Cups. This cup is packed 200 cups per case and does include lids and straws. Make a lasting impression with your customers with this 32 oz plastic lemonade souvenir cup! Looking for something new and unique? Then check out this 32 oz Strawberry Top Lemonade Cup. These cups are perfect for strawberry lemonade. Guaranteed to grab the attention of all passersby. Great novelty and souvenir cup to increase sales. Packed 100 cups per case. Looking for a more economical souvenir lemonade cup than 32 oz Souvenir Lemonade Cup listed above...then the LEMONCAR 32 oz Souvenir Cup is for you. Packed 504 cups per case for only $104.00. Comes with lids but not with straws. Reuseable cups for refills or for taking home for use for years to come. Attractive decorative lemonade cup. Bright and colorful Green Straws for the 32 oz. LEMONCAR or Premium Lemonade Souvenir Cup listed above. Packed 500 per box and green color to compliment the cup. Now Standard Concession Supply offers our new 32 oz. Premium Economy Lemonade Cup in a combo pak with Lid and Straw included. These classic Lemonade Stadium cups are now available in a co-pack option. Each case comes complete with 350 cups, forest green lids, and 9" yellow super straws. This cup in made in the USA, 100 % BPA free, 100% Recycle, SQF and HAACP Certified and dishwasher safe for re-use. Premium Economy 32 oz. Plastic Lemonade Cup. Packed 500 Case. A luxury cup at economy rates. Our injection molded, stadium grade lemonade cup will give your customers a souvenir to remember their trip or event by. They can re-use these sturdy well made 32 oz Souvenir Cups. These cups are made with more plastic so they will not weaken or bubble in the summer heat. Lid is included. Straws can be ordered separately. New Clear Emoji Souvenir Drink Cups. These cups will bring some fun and LOL to your drink sales. These 32 oz Emoji cups can be used for lemonade, sodas, tea, and more! These cups feature your favorite emoji faces. Make a splash with your drink sales with these all new 32 oz emoji drink cups. Packed 300 cups per case. New at Standard Concession Supply......32 oz Lemonade Tin Mug. This lemon ice design mug is packed 50 cups per case. Great Novelty or Souvenir Item for take home value. 32 oz Stainless Steel Drink Mug. Great Novelty item for Lemonade or Soda Carts. Eye catching and will be a great take home souvenir item. If you do refills, this cup will be a great item for refills. Packed 80 cups per case. If you are interested in our 16 Stainless Steel Mugs, head on over to our Souvenir Cups Page. Clear 32 oz (946 ml) We Squeeze To Please lemonade Souvenir Drink Cup. Unique and stylish cup featuring a clear cup with the emblem we squeeze to please and with a yellow corrugated straw that will set you apart from the other vendors. Comes with red lid. Packed 300 cups per case. Great for lemonade and other fun drinks. New...32 oz Lemonade Cup with themed logo "We Squeeze 2 Please" This popular bright and attractive cup features a red top combined with the yellow body with modern green and red logo design. Yellow straw is included. This cup is eye catching and will increase sales. Be the first to use these new 32 oz. Lemonade Cups. These souvenir cups are packed 300 cups per case. If you are looking for a clear 32 oz cup to serve lemonade with, then this Clear We Squeeze to Please Lemonade Cup is for you. This Clear 32 oz Lemonade cup features attractive and festive lemonade graphics to show off your great tasting lemonade product. Packed 592 cups per case with 600 lids. New at Standard Concession Supply, We Squeeze To Please Lemonade T-Shirts. Show your your customers some flash and style with these nicely done yellow with green print t-shirts. Comes in 4 sizes. New at Standard Concession Supply...We Squeeze To Please Lemonade Apron. Give you self the complete lemonade look along with our Squeeze to Please Aprons. Pockets available by special order only. New We Squeeze To Please Baseball Hat. Complete your professional lemonade look with this nifty We Squeeze To Please lemonade hat. Plastic Lemons On A Rope Decor. Great way to add some decor to your lemonade stand or cart. Makes a statement that you make great tasting and fresh lemonade. 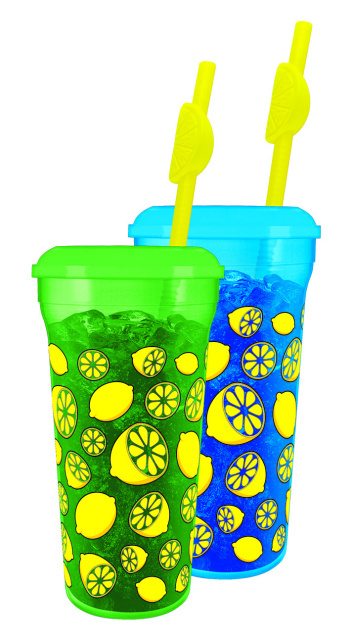 New ....Create a Splash with your Lemonade Sales with these new 32 oz Mini Lemonade Tankers. These Squeeze To Please Mini Tankers designed with a handle make for a great novelty and souvenir item to use at carnivals, fairs, zoos, water parks, and more! Packed 24 Tankers per case. Fire up your fresh squeeze lemonade sales with this 3 Dimensional Sparkle 32 oz Lemonade Cup. This 32 oz lemonade drink cup features a new fun design on a transparent sparkle bottle with an attractive lemon top with straw. Great Novelty item! 32 oz Lemonade Flip Top Bottles. This 32 oz lemonade flip top sports bottle has a distinctive fun design that will put a smile on your customers' faces. Each case of cups include a mix of yellow and green cups, and self contained lids and straws. Packed 100 per case. New for 2018....32 oz Lemonade Souvenir Bottle with Shaker Lid. Too busy with long lines to shake your lemonade, this is the bottle for you. Save on Labor as your customer will enjoy the unique experience of shaking their own lemonade with this Lemonade Bottle that features a shaker lid. It will be fun time as customers will see how easy to shake their own lemonade. Cups Made In The USA. 32 oz Lemonade Souvenir Cup Window Decal. Static Cling Decal dimension is 12" x 16". The decal will attract attention and bring customers to your stand. New 2018 Design....Large 64 oz Souvenir Lemonade Cup to take your profits to a new level. A popular item to promote your lemonade sales.. Packed 12 containers per case. Head on over to our souvenirs page if you are looking for Pepsi or Mountain Dew Tankers. 32 oz Lemonade Mini Tanker. Give your lemonade drink sale a different look with this 32 oz lemon design mini tanker. Comes with lid and straw. Packed 24 tankers per case. New 64 oz Lemon Ice Jug with Handle. Lemon Ice designed Souvenir Jug/Bucket includes lid, handle, and straw. Uniquely designed bucket will be a great novelty item for your customers to take home, as well as, enjoy at your next event. New Professional Manual Juicer. Whether you are squeezing lemons for fresh lemonade, or squeezing oranges, grapefruits, or limes, this heavy duty cast iron juicer might be just for you. This squeezer features a ergonomic rubberized handle that will withstand 2300 psi(pounds per square inch). This lemonade juicer also features a heavy base with rubber grip feet for greater stability and longer handle for additional leverage. New and improved Lever Type Lemonade/Citrus Juicer. Sturdy stainless steel construction lemonade squeezer will crank out the lemonade you need to meet the demand on those warm and hot spring and summer festival days or for any other commercial venue you are working. Accommodates all paper cups as well as the 32 oz and 44 oz plastic souvenir cups. Unique design gives leverage over entire fruit. Removable strainer for easy cleaning. Something new and fun ...it's the Mr Corny Sr Corn Cob Drink Cup. This cup is great for lemonade and for other drinks. Rated as a 32 oz drink cup that comes with lid and straw and is packed 50 cups per case. Grab these cups today and you will be amazed at the profits Mr. Corny will generate. Great for roasted corn stands, corn maizes, and fall festivals. 16 oz Jr Mr Kernel Jr. Drink Cup. This cup is great for lemonade and for other drinks. Rated as a 16 oz drink cup that comes with lid and straw and is packed 70 cups per case. Grab these cups today and you will be amazed at the profits Mr. Corny will generate. Great for roasted corn stands, corn maizes, and fall festivals. The 16 oz cup is the smaller of the two Kernel Cups featured. Fun cup item at Standard Concession Supply...where the fun never ends. The 32 oz. Fun Cup is designed with a variety of fun items pictured around the face of the cup. Bright and colorfully designed, this new and fresh look cup will attract a lot of buying customers. Some of the items featured in cartoon characters include funnel cakes, candy apples, pretzels, and popcorn. In addition, words Eat Up The Fun are prominently displayed on the cup. Packed 300 per case. Cup comes with lid and straw. New 44 oz. Lemonade Drink Cup. Packed 210 cups per case. Traditional lemonade design on cup. New Super Sqeeze design. These cups are made with more plastic so they will not weaken or bubble in the summer heat. This injection molded lemonade cup will give your customers a souvenir to remember their trip or event by. This cup is made in America, 100% BPA free and HAACP Certified....the highest stamp of approval for safety and cleanliness. The healthy choice. Lids and straws are included. Attractive 24" x 12" Retangular Lemonade Sign. Make a statement with your lemonade business. New.Paragon Lemonade Wagon. Made of stainless steel, this Lemonade Wagon is great new way to serve up lemonade. Great starter wagon for those wanting to get into the lemonade business or for those seasoned professionals who might want to get back in after being on a hiatus. This bright and colorful lemonade wagon includes red and yellow umbrella and blue base. Umbrella features two adjustable settings. One is at 92" tall and the other at 97" tall. When the umbrella is fully extended, it fills to 92" wide. Also features large work space on top that extends out 66" long...making the work space a great area to prep for your lemonade business. Once you click subscribe, you will receive an email in which you need to respond by clicking the confirm link in that email. Otherwise, you will not be receiving our newsletter until this is completed. Standard Concession Supply also features Palm Tree, Coconut, Trumpet, Emoji Yarders, Pineapple Cups, Hurricane Cups, and more in our Tropical Drink Cups Store. Or, if need Tea Cups or Root Beer Cups, we now carry these and other novelty cups on our Souvenir Cups page.